While I was away in Germany I got the opportunity to go in on a 30 gallon oak barrel with a couple of friends in Victoria. The barrel had previously been used for red wine, but only briefly. Our plan is to put a couple of beers through the barrel relatively quickly to try to strip the remaining barrel character and then put some sour beers into it. One beer has already come out of the barrel (a belgian amber/dubbel) and a second, an orval-esque brett belgian pale/amber, is in the barrel now. At this point the only non-saccharomyces added to the barrel has been dregs from Crooked Stave's Hop Savant, a 100% brettanomyces beer. From the barrel samples and bottles of the first batch that I've tasted, in seems like we are getting a good level of oak after a month or two. The oak character is pretty mellow, definitely different from what you would get from something like oak cubes. The brett isn't terribly strong in that much time (and Chad at Crooked Stave selects his brett strains to be more fruity and less funky, which would make the brett character blend with the beer more rather than standing out) but it is there. I've also noticed some tartness, especially in a recent barrel sample of the brett pale. While there are lactic acid bacteria in many of the Crooked Stave beers, to my knowledge Hop Savant only has brett. Brett doesn't generally give sourness in beer, though in the presence of oxygen it can produce acetic acid. The barrel sample didn't really taste acetic, but it could be at a sufficiently low level so that vinegar flavor isn't coming through. So it could be that we have picked up some bacteria along the way (which wouldn't be too surprising, and fits the long term goals of the barrel) or we are getting enough oxygen for a very low level (sufficiently low to be pleasant) acetic character from the brett. My advanced mash recirculation system. I wasn't able to take part in the brewing of either of the first two beers through the barrel as I was away but I was excited to brew some barrel-destined beer upon my return. In a week and a half the brett pale will come out of the barrel and after a quick cleaning it will be ready for a new brew. So we'll have to have a beer which is done with primary fermentation and ready to go in. This time we decided to go with a saison, which of course I was pretty happy with. (Sidenote, for some recent blog posts on saisons, he's one from me and a nice post from the Mad Fermentationist) With three of us brewing now that makes things a bit easier to fill the 30 gallon barrel. I had to split my 10 gallon share (we are actually all shooting for 11-12 so that we have enough clear beer after primary to completely fill the barrel) into 2 brew sessions as I don't have equipment large enough (yet) for a full 10 gallon batch. We wanted to keep this pretty simple and the recipe generally matches my typical saison base grist. The only thing I didn't do here that I would normally do for the grist is some way to add a bit of acidity. As I mentioned above, there is a bit of acidity in the beer that is currently in the barrel so I figured that this component would be taken care of while aging in the barrel. And I also didn't have the time for a sour mash or a sufficient amount of acidulated malt around. The FG I am anticipating is a bit higher than I would typically shoot for but still appropriately dry. I didn't want to get the beer too low and not leave anything for the coming months of barrel aging. Target numbers were a bit loose compared to what I would typically do but I figured that is fine as we will be blending 10 gallons of wort from 3 brewers each and then letting that sit for a while. Yeast Bay Wallonian Farmhouse - a suitable pitch size was grown up by one of the barrel owners for all three of us to use. Water in Victoria is very low in everything, so it is basically like starting with distilled water. I added ~95 ppm Ca2+, 45 ppm Cl- and 170 ppm SO42- with CaSO4 and CaCl2 additions to the mash and sparge water. My three carboys of barrel-destined wort. The goal was to start relatively low (for a saison), at around 66F/19C and ramp up to about 74-76F (23.5-24.5C) over the first 3-4 days or so and then hold it at this temperature until fermentation is done. As I mentioned above, I needed two brews (and 3 carboys) to make this beer. Overall the two brews ran pretty smoothly. My gravity was a bit high and my volume low on the first batch. I compensated on the second by increasing my target volume (and subsequently decreasing my gravity target). While I ended up hitting my desired volume my overall gravity was a bit lower than planned with an average around 1.049. The hot side of brewing in general, and especially for a yeast-driven beer like saison, is pretty forgiving so I'm not to worried about that lower gravity. And the slightly lower start should still be fine if the beer finishes as low as I'm looking for, though it may take some time in the barrel to hit my target. This is a pretty interesting yeast to work with, and so far I am happy with the results. This yeast is super non-flocculent! Even though my pitch from our starter sat in a jar in the fridge for days before brewing, the liquid was still very cloudy. Fermentation kicked off pretty well and The krausen was pleasantly tame and even though I ended up filling my carboys pretty high, there was never any danger of blow-off. Throughout the course of fermentation the airlock smelled great. There was a strong grapefruit and other citrus as well as tropical fruit character coming through and never any sulfur. At about 5 days in the primary, the fermentation has tapered way off and the gravity is still rather high (~1.020). The carboys are still working away so we'll see where it ends up, but after talking to friends that have used the yeast and looking for what I can find on other blogs about this yeast (such as this post) it seems that my initial FG target is likely at the low end of what this yeast is going to do without more coaxing and a specific mash plan for very high attenuation. I guess we'll see where it goes from here. 6-July-2014: Quick gravity update. We're getting there now with two carboys around 1.010 and one down to 1.005. 14-July-14: I'm happy to report that my final gravities on all three carboys got below 1 Plato (or 1.004), which is where I like my saisons to finish. Perhaps I wasn't terribly confident that the yeast would take it this far (even though Yeast Bay describes this yeast as giving "absurdly high attenuation" after talking to friends and seeing another blog post with an FG in the high single digits for specific gravity. But the high attenuation claim was right on. The only other yeast I've seen behave like this is Wyeast 3711, French Saison. Overall I'm very happy with the way this yeast behaved (that may warrant a quick post all on it's own, we'll see). 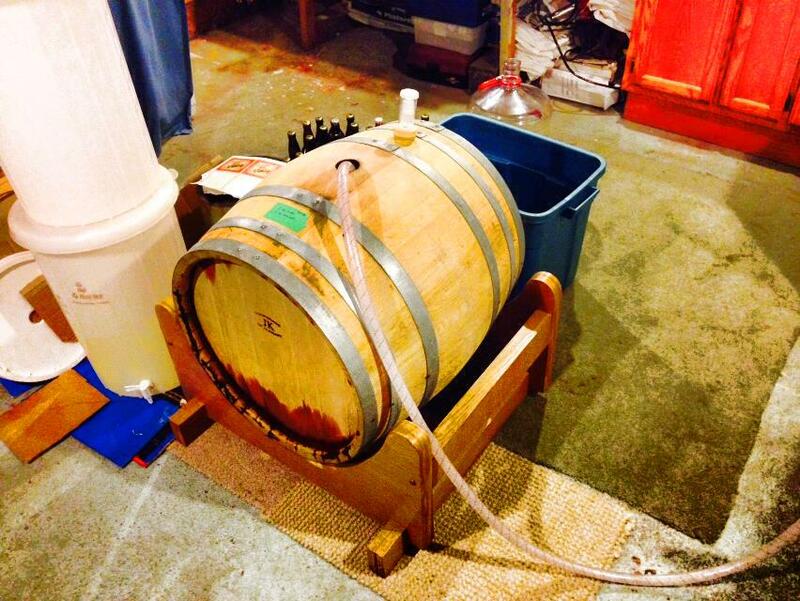 The beer went into our barrel, along with the 2 10 gallon portions brewed by the other barrel owners, on July 11th. We intend to leave it there for 2-3 months or so, balancing the amount of oak we extract with the development of tartness and brett character.